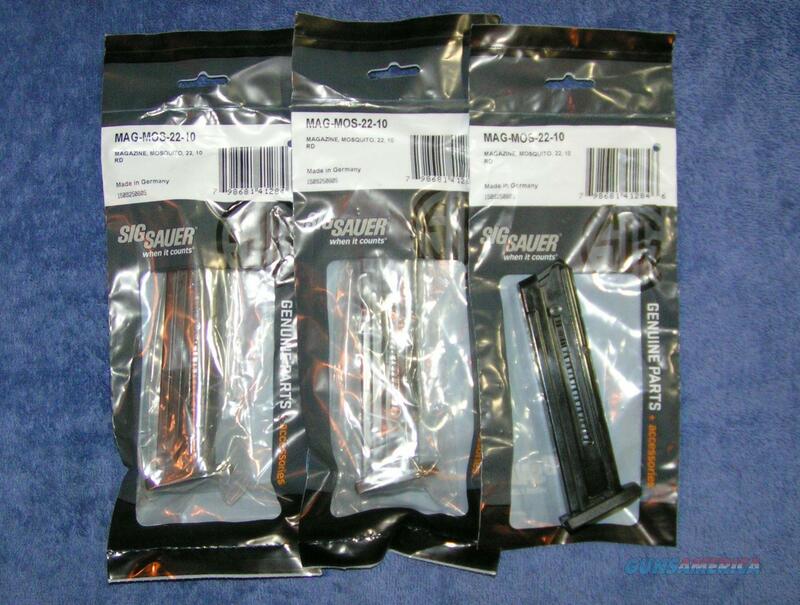 Description: Three new factory Sig Sauer mags for the 22 cal Mosquito. 10 round capacity. Factory new. Stamped "22 long rifle" on one side and "SIG SAUER" on the bottom. Price is for a group of 3 mags. More might available at the same price. I accept all credit cards, also cash, personal checks, company checks, money orders, cashier's checks and bank checks. No credit card fee. Paypal accepted too (no fee). Free shipping. Florida residents add 7%. I combine shipping. UPC 723364200892. Sig# MAG-MOS-22-10. Rich.